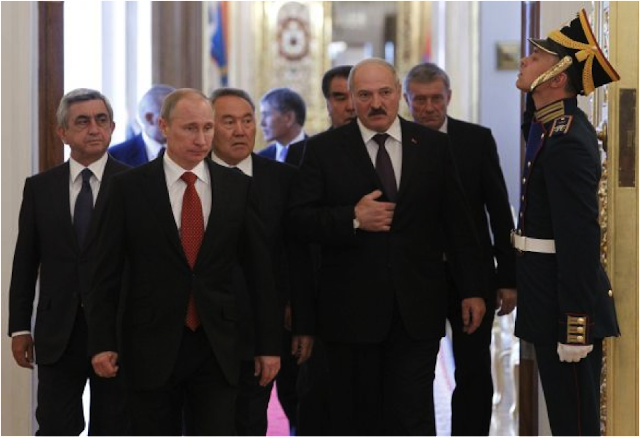 Newly elected Russian President Vladimir Putin meeting with heads of the CSTO and other regional leaders in early May. The Moscow Times. Two weeks ago, US President Barack Obama hosted the G8 summit at Camp David consisting of the heads of state of the world’s eight largest economies. However, this time there was a notable absentee, newly re-elected Russian President Vladimir Putin who opted not to attend, citing the need to form his government and appoint his cabinet. Much has been said about this decision with speculation that this was a rather blatant signal that US-Russia relations are at a low ebb. In recent months, Russian displeasure has been evident particularly following the state department’s public criticism of the Kremlin’s democratic standards during the widespread anti-government protests in the Russian capital. Putin went as far as accusing secretary of state Hillary Clinton of inciting the protests, a rather bold claim but one that does show the extent of Russian feelings on what they have traditionally viewed as foreign meddling in their domestic affairs. That Putin’s decision not to attend the G8 was some form of a ‘snub’ is in many ways also re-affirmed when considering the Russian president’s usual desire to be in the public eye and to project an image of Russia as a great power. Missing an opportunity to attend a meeting as high profile as the G8 does in fact seem unusual, especially considering the two main topics of the agenda were the Eurozone’s financial crisis and international security particularly concerning Syria and Afghanistan, both of which have the potential to cause adverse consequences for Russia with the former possibly affecting the price of oil and the latter de-stabilising security in the already volatile Russian neighbourhood. Obviously, all this draws a rather grim picture of US-Russian relations. It is a well known fact that despite attempts to reset the relationship since Barack Obama’s accession to the White House, things have not gone particularly smoothly with the two powers clashing on a number of topics, including the planned US missile shield for Eastern Europe and their opinions on how to deal with the situation in Syria. However, it is also important not to read too much into Putin’s decision not to attend. The publicity surrounding this decision almost completely overshadowed the fact the Dmitry Medvedev, the now former Russian president and newly appointed Prime Minister did in fact attend. So while the situation may suggest a clash of personalities between Putin and Obama (and some of his subordinates such as Secretary Clinton) it does not suggest a widespread breakdown of relations. While some kind of reconciliation may be required – it has been four years since Putin was a head of state – it does not represent a major turning point in the relationship. 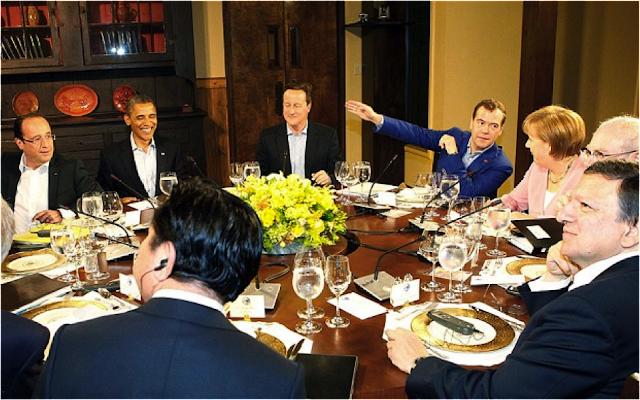 Newly appointed Russian Prime Minister Dmitry Medvedev in attendance at the G8 meeting at Camp David. The Telegraph. It is also worth considering the excuse given for not attending the summit. While as mentioned already Putin has always relished the opportunity to be seen on the big stage, it is worth noting that he has also always sought to maintain a strong position at home and within Russia’s immediate neighbourhood. It does seem fair to suggest that leaving Russian soil for an overseas summit which in many respects simply represents an opportunity for ‘group cuddling’ may not have been a wise move. Putin was only re-elected two months ago and this came in a time of unprecedented protests against him and the political establishment in general. Hence, his decision to stay may have been truly based on the domestic situation. Furthermore, in the run up to his re-election he did stress his desire for Russia to re-focus its energies on relations with its neighbourhood. Putin already met with the heads of the of the Collective Security Treaty Organisation (CSTO) and non-members including the Ukraine and Moldova in early May, confirming he prioritises this region. Likewise, he has sought to capitalise on some of his neighbours’ weaknesses early on in order to strengthen the Russian position. For example, Ukraine and its president Victor Yanukovich have faced mounting criticism from the EU over the imprisonment of former president Yulia Tymoshenko and the voices of dissent are getting louder with senior EU figures, including the President of the EU commission Jose Manuel Barroso, threatening to boycott the Ukraine legs of the upcoming European Football Championships to be held jointly with Poland. This seems to have provided an opportunity for Putin to put pressure on his already besieged Ukrainian counterpart to sign a free trade agreement which other former Soviet states have already ratified. So where does all this leave us in regards to what Putin’s decision not to attend the G8 says about the current state of play between Russia and the US? Well, it seems fair to suggest very little has changed. Even before this so-called ‘snub’ there was some obvious discord in the relationship occasionally manifesting itself when the two disagreed on major policy issues. However, when it has seemed necessary Obama and his Russian counterpart (previously Medvedev and now Putin) have met or will meet. In fact, it seems that the US administration went out of its way to stress it was neither ‘surprised’ nor ‘disappointed’ and pointed that Obama and Putin will in fact be meeting in the coming month (at the G20 in Mexico). So nothing it seems has changed for the worse in the relationship between the US and Russia, however it is also fair to suggest that nothing has changed for the better. And this is now the challenge for both parties to address. With Putin now in the picture for at least another six years (having amended the constitution to allow for six year terms) the US now faces the challenge of finding ways to constructively deal with the Russian regime on a number of serious issues including global security and economic stability which could have dire affects for both should they be mishandled.